Heat a tsp of oil and fry the above ingredients (except coconut) till dal turns golden brown. Then add coconut and fry for some more time. Powder it and keep it aside. Cook rice. Add a tsp of sesame seed oil and spread it on a plate to cool. Soak tamarind in warm water ( approximately 2 - 2 1/2 cups) and extract its juice.Throw the pulp. 1.Heat 2 tsp of oil, add mustard seeds, when they splutter, add fenugreek seeds, hing, red chilli and chopped onions. Saute till onions turn transparent. 2.Add fenugreek greens, turmeric powder and saute for a few minutes . 3.Add tamarind water, masala powder and needed salt. Let it cook till it becomes thick. 4.Now mix the rice gently with the masala and serve hot with papads or chips or any raitha of your choice. Meet you all again with another interesting post,till then it is bye from Padhu of Padhuskitchen. Recipe looks healthy and tasty. Fenugreek leaves rice looks delicious. Very inviting and healthy rice, looks wonderful Padhu..
Never had this kind of rice but it looks very delicious. I love the decoration around it.It makes it look even tastier. delicious combination...looks wonderful and yummy !!! Healthy n delicious rice! Great presentation, Padhu! Rice looks so healthy and tasty. Excellent garnishing with Methi . Very healthy one-pot meal, and lovely arrangement! This is gonna be a healthy and wonderful dish! awesome rice recipe. wonderful combo. yummy rice with lovely "Tree" presentation..
nice way of making methi rice in a southindian style. Wow!What a healthy and tasty dish.Love it. Healthy one, looks delicious...nice presentation. Yummy version of methi rice! Very delicious .. I love your style of presentation. Glad to follow your blog. Padhu, Thanks for this great recipe with Methi! 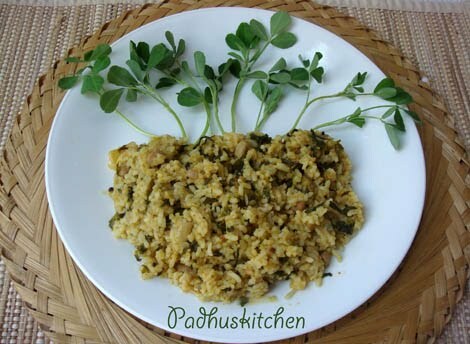 We have started eating Methi only because of this flavorful rice dish. No trace of bitterness at all. Thanks for sharing !